With her face pressed tight to the console in front of her, Ryanne Denning used only the slightest movements of her hands and feet to move the arms of a multi-million dollar robot. She wielded tiny tools — only millimeters wide — pinching and cutting and cauterizing the red tissue and yellowish fat of a heart. Step by step, an expert guided her through the process of operating on an organ with a da Vinci surgical robot, her every movement magnified on a large screen, for other students to see. Denning, a senior at Boise High School, was one of about 150 high school and college students in medical programs who were offered a chance to use the da Vinci at a robotics in surgery seminar hosted at Saint Alphonsus Regional Medical Center, Wednesday. Students studying in a Certified Nursing Assistant program in area high schools watch a peer operate on a pig’s heart with the da Vinci surgical robot at Saint Alphonsis Regional Medical Center. 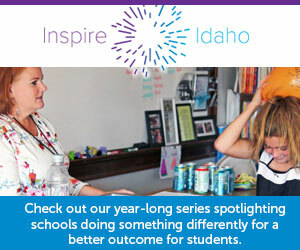 Photos by Sami Edge/Idaho Education News. They didn’t operate on live organs, of course. Machine experts and hospital surgeons walked the students through mock-surgery on a pig heart, filled with fake blood and rigged to simulate the pumping of a real heart. Cristal Mendoza and Karina Colunga of Nampa High School use more traditional surgical tools during a demonstration at Saint Alphonsis regional medical center. Saint Alphonsus physicians explained to the Boise area students how they use the da Vinci for surgery on the esophagus, lungs, colon and more. The robotic procedure helps minimize recovery time and creates less pain and scarring than more invasive surgical techniques. The goal of the robotics event was to acquaint students with the advanced surgical technology and hopefully inspire them to pursue careers in healthcare or other STEM fields, said Dr. Christopher Reising. “When I’m old and crusty I’m going to need someone to operate on me,” Reising told a group of students who had just arrived to see the robot. Lanae Hartley, a junior at Skyline High School in Boise, takes a picture of the pig heart set up for mock surgery with the da Vinci surgical robot at Saint Alphonsus Regional Medical Center. healthcare in her own life sparked Hartley’s desire to work in the medical field, she said. She has her eyes set on becoming a surgeon. As she waited for her turn at the machine, Hartley took pictures of the robot at work and watched her peers conducting surgery on the big screen. If she becomes a surgeon, Hartley said she’d want to use the robot to optimize outcomes for her patients.